Time to show off some awesome photos! Thank you to all the readers who’ve sent in photos of their crochet work. It’s always fun to see what everyone crocheted! Have a blast browsing the photos and don’t forget to leave a comment at the end of the post to share your likes. 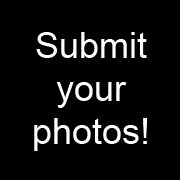 If you’d like to be included in a future roundup feel free to submit your crochet pictures. 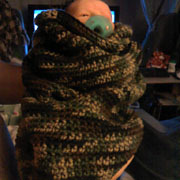 Nancy crocheted a Basic Baby Cocoon for this cutie. Charlotte made a queen size granny square blanket. Edwin creates a blanket with the Mitered Square Tawashi. 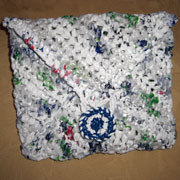 Di uses the envelop pattern to create a clutch with plarn. 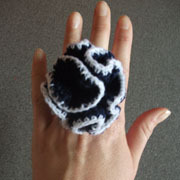 Di crocheted a larger version of the Crazy Ruffle Ring. 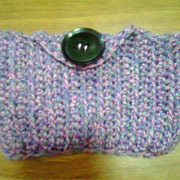 Julia crocheted the Simple Cell Phone Case. Julia made the Perfect Fit Hobo Bag with a neat button. 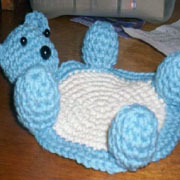 Katheryn uses the Teddy Bear Coaster Crochet Pattern. MGH did the Vortex Tawashi and the Square Tawashi. 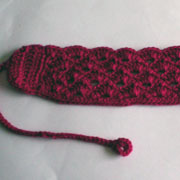 MGH crocheted the Lacey Headband in red. 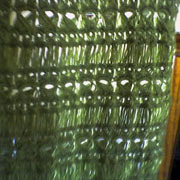 Rose makes a nice Broomstick Lace Wrap. 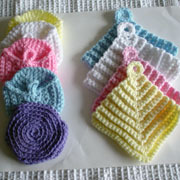 Click here for info on how to submit your crochet photos. This entry was posted on Tuesday, July 26th, 2011 at 12:00 AM by Rachel Choi	and is filed under News. You can follow any responses to this entry through the RSS 2.0 feed. You can leave a response, or trackback from your own site. I love the baby cocoon and the hobo bag! Grat job everyone! The baby is super cute 🙂 And that headband inspired me to make one for myself. I love Edwin and Charlotte blankets! Great job! They must have taken quite a bit of time. 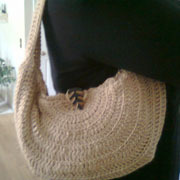 All are very nice, especially hobo bag, queen size blanket, baby cocoon, lacy headband and broomstick lace wrap! I love the headband. Now I want to make one for myself. The blankets are great, and they reminded me I have to work on the blanket for my friend. 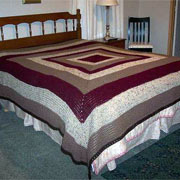 A *queen-sized* granny square blanket … Charlotte, my hat’s off to you! Superb collection and some patterns so inspiring.I crochet every day and love to create new designs.love crochet spot! Many thanks for praise. Yes it took 2 months non stop to get it done. The last 2 double crochet rounds took a skien of yarn itself. Then the edging took another skien. It was a gift for my cousin this Christmas. It looks like to weigh a lot but really not that heavy, has a spongie feel to it. lol. Thank you for your comment. The baby blanket did not take too much time. I think it too me about two weeks. 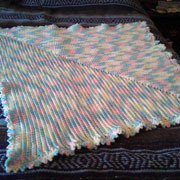 I did block the blanket and it looks great. I’m entering it in the County Fair this weekend. I was wondering how much yarn you used for the queen sized blanket? I am trying to make one in chunky yarn for myself but can not figure out how much yarn to buy.